This time i will go a bit into abinthe. What it is, why it got banned, the drinking method's, etc. Probably not going to fit into one article all at once, so bear with me. To start off, abinthe is a very old liquor dating from the 17th century, and used to be very popular among all ranks of society around the 19th century. While absinthe was very popular around then, the wine industry had a all time low. That's what also coased it's main downfall. The rumours about the wormwood's thujone making you go crazy was hyped allot by the recovering wine industry. One additional problem was that allot of people drank bad quality absinthe, that contained poisonous substances. And due lack of research most countries simply banned the drink almost 100 years ago. The main ingredients for the flavours are wormwood (where the thujone comes from), anise and sweet fennel. Allot of the *better* absinthes are distilled, and the main reason people often use some sugar when preparing absinthe, is to mark the really bitter taste from the brands that don't distill their spirit. Since undistilled, it will remain a very bitter substance. After the distillation other herbs are added to give it the green yellow colour. Altho there are brands that use artificial coloring to get a really bright green. That brings us to the way absinthe is prepared. 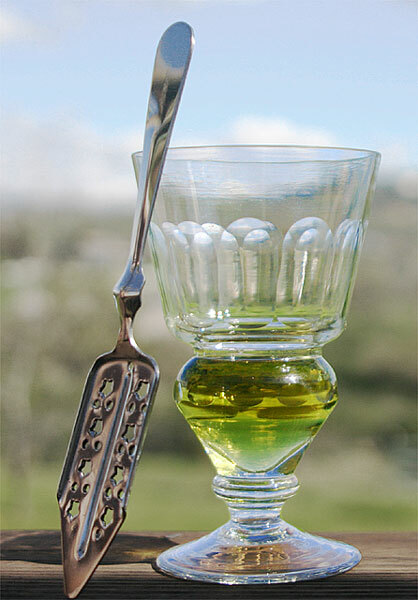 The standard procedure is to add a bottom of absinthe to a glass, then drip (slowly) icecold water into the glass. What will happen is, some of the herbal extracts that are *hidden* in the alcohol separate when you add the ice cold water. Thats why the drink becomes less transparent and more white. Often it tends to be a 1/4 part of absinthe and 3/4 parts of water, but basicly when the whole drink is evenly cloudy, it's done. That may sound watery, but since the spirit contains around 60% or 70% (120/140 proof) alcohol, and the water breaks allot of the aroma's loose, thats not the case. As said before, due to horrible quaility absinthes people where adding sugar into the mix, dripping the ice cold water on top of a sugarcube, on a special absinthe spoon. This would hide the very bitter taste of non distillated absinthe. Then there are also people who light the icecube on fire, but just like 101 proof rumcocktails, thats usually just for the showfactor. I will get into a more detailled article about thujone, and the myths it has created around absinthe later on. And as usual, feel free to comment or correct me. Perfect absinthe will come forward with a brown/green color and the adding of ice water will make its color almost surreal. It's marked effect is not like that of typical alcohol products. There is no 'letting down' of inhabitions and acting silly like the immature mind may be in want to believe, given they seek 'highs'. Extraordinary drink for extraordinary minds.